To know more about pressure ulcers, click here. A pressure ulcer is caused by unrelieved and prolonged vascular compression on a specific area of the body, usually a bony prominence, from a supporting item such as a bed or chair. The ulcer forms when there is ischaemic necrosis (lack of blood supply) of the skin and subcutaneous tissue. Several factors contribute to the development of pressure ulcers, these may be extrinsic (independent of the patient) or intrinsic (dependent on the patient’s condition). Skin resistance is reduced by age, long term corticosteroid treatment and deficiency conditions. Local hypoxia due to arterial disease and/or venous return anomalies, diabetes, cancer, infection, anaemia and hyperthermia are all risk factors. Maceration due to both urinary and/or faecal incontinence may cause skin abrasions. Pressure ulcers are a potential problem wherever patients are immobilised for any prolonged period of time. In many cases, a person with a pressure ulcer also has one or more medical conditions that may affect treatment and healing. These conditions include diabetes and heart disease. Pressure ulcers are a common condition among patients in acute- and chronic-care facilities. Studies have suggested that, at any given time, 3-10% of hospitalised patients have pressure ulcers and 2.7% develop new pressure sores. Pressure ulcer prevalence in long-term care facilities was estimated from 11-30%. Among patients with neurological impairments, pressure ulcers occur with an incidence of 7-8% annually, with a lifetime risk estimated to be 25-85%. Recent findings from Germany show that between 2002 and 2008 the incidence of pressure ulcers decreased from 12.5% to 5%, probably due to better preventive strategies. 80% of pressure ulcers are on the sacrum (tailbone) or heels. Another frequent location is the trochanter (hip bone) when patients lie on their sides, other areas at risk are the occiput, elbow and ischium. Pressure ulcers may be classified by anatomy or by colour. 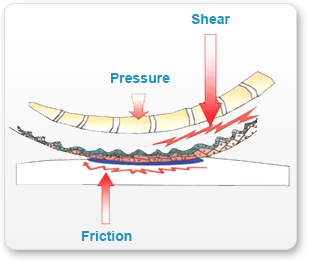 Pressure ulcers can be broken down into different stages. These are different manifestations of the pressure ulcer, and not phases that necessarily follow each other. A patient at risk (e.g. one with an orthopaedic or neurological disorder combined with a deterioration in their general condition causing immobility and an increase in bearing pressures [for example a surgical operation, prolonged immobilisation, age, etc.]) with no visible lesion may have a stage 0 pressure ulcer. This sub-clinical stage i.e. the skin is intact, is manifested by a red area that is reversible, this means that under pressure this red area will turn white. Stage 0 is a warning stage. This is a red patch, an oedema or an induration that is sometimes hot (hyperthermic) and often painful, it does not turn white under pressure. This persistent erythema is a manifestation that the epidermis, or even the dermis, is affected. Special care is necessary at this stage. Massaging the area is not recommended as it could exacerbate the condition. The skin is not broken at this point. The epidermis, dermis and hypodermis are affected, but the muscle fascia is not damaged. The photograph shows a pressure ulcer covered with a dry, blackish, necrotic plaque adjacent to healthy tissue. This is a definitive sign of devitalisation of the underlying tissues. The external appearance is deceptive and does not provide any indication to the extent of depth the lesion. It is delimited by a groove which, as it progresses, will cause separation of the entire plaque. This dry necrosis tends to become wet and subsequently fibrinonecrotic. Tissue damage goes beyond subcutaneous tissues and affects underlying structures: muscle fascia, tendons and/or joints. The clinician assesses the percentage of the surface of the wound represented by each colour and determines the colour of majority of the wound bed. This technique is useful within a department because it facilitates communication and transmission of information. It can be a complementary element to another method of evaluation such as remote transmission digital image but requires training and has low inter-user reproducibility. Most stage 1 and stage 2 pressure ulcers will heal within several weeks with proper treatment. Stage 3 and 4 pressure ulcers can take many months to heal. Even though progress is slow, continued care and treatment can prevent complications such as further tissue damage, infection and pain. The first step is to correctly assess the pressure ulcer(s) for location, stage, size, wound bed, exudate, pain and status of the surrounding skin. Any undermining and sinus formation should be determined. Pressure ulcers should be reassessed frequently, on a daily or at least a weekly basis. If the condition of the patient or of the wound deteriorates, the treatment plan needs to be re-evaluated as soon as possible. Any complications that result from the patient’s underlying health problems need to be addressed to improve the success of healing. Pressure ulcers should be assessed daily to monitor complications which would require debridement. To stimulate the healing process, pressure ulcers are often debrided this is the removal of nonviable (necrotic) tissue. Debridement helps to control and prevent infection, defines the extent of the wound. However it should only be used when appropriate for the patient’s condition and consistent with the patient’s goals. Autolytic debridement, this is the lysis of necrotic tissue by the body’s white blood cells and enzymes it leaves healthy tissue intact. In a moist healing environment under a dressing this is the naturally occurring physiological process. Chemical debridement which is achieved by topical application of enzymes such as collagenase and denaturing agents such as sodium hypochlorite which is non-selective. Surgical debridement includes the conservative, sequential removal of avascular tissue, using sterile scalpel or scissors and forceps performed at the bedside and debridement performed by a surgeon in the operating theatre. Others techniques also used include: laser, hydrojets, maggots, honey etc. Cleanse wounds as necessary with clean water or with saline.Use minimal mechanical force when cleansing or irrigating the ulcer. Showering is appropriate. Irrigation can be useful for cleaning a cavity ulcer. Antiseptics should not routinely be used to clean wounds but may be considered when bacterial load needs to be controlled (after clinical assessment). Ideally antiseptics should only be used for a limited period of time until the wound is clean and surrounding inflammation reduced. Dressings should be used in accordance with the manufacturer’s instructions and need not be changed every day. Frequent removal could damage the wound bed. Regular observation and reassessment of the pressure sore will demonstrate the progress of healing and if there is a need to change treatment objectives. To help avoid infection of pressure ulcers, wound cleansing and debridement are important. The patient’s environment must be kept clean and dry particularly in the case of incontinence. If the ulcer is infected then appropriate antibiotic therapy must be commenced. Pressure ulcers can have an important impact on the patient’s quality of life on both a physical and psychological level. Physical pain from a pressure ulcer is one of the major factors to affect quality of life: on a daily basis there may be pain during the treatment of the wound, during cleansing and dressing changes. Pain may also result from the patient not being properly positioned and supported in their bed or chair to relieve pressure on the ulcer. Infection and inflammation in the wound will also contribute to the pain burden. Proper skin care is crucial to help prevent pressure ulcers forming. Skin care involves inspecting the skin daily and keeping it clean, using warm (not hot) water and mild soap. The skin over bony prominences should be treated very gently and moisturised if the skin is dry. It is important to avoid putting pressure on areas that are vulnerable to pressure ulcers or where pressure ulcers have already formed. Friction and shear also need to be reduced. Skin over bony prominences should be checked frequently for the earliest signs of pressure ulcer formation (Stage 0) where skin redness can be reversed, pressure ulcers can form very quickly. The use of Sanyrene (Corpitol 60), an oil containing hyperoxygenated glycerides from essential fatty acids, has been shown to reduce the risk of pressure ulcer formation by 50%. It is indicated for use on the skin of all patients at risk of developing pressure ulcer especially at stage 0. Gently apply using fingertips during one minute. Repeat application on each area 2 to 3 times per day, at each repositioning. Careful attention should be paid to the patient’s diet, nutritional status and continence.